The Governing Board took action in December to approve a change in policy regarding the amount of time parents have to clear a student's absence. The new policy states that all absences must be cleared within five days of the absence. The policy applies to students in all grade levels. 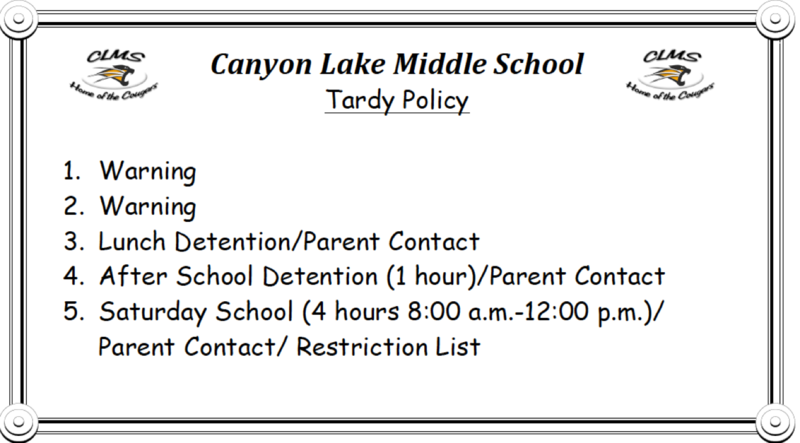 To clear a student's absence from school at Canyon Lake Middle School please call 951-244-2414. Truancy Letter 1 is mailed out after 3 days or 18 periods of unverified/unexcused absences. Truancy Letter 2 is mailed out after 6 days or 36 periods of unverified/unexcused absences. Excessive excused letters are mailed out after 14 days of excused absences without a doctor note.